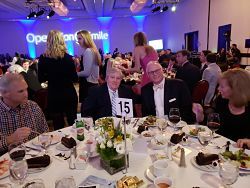 The Marriot in Downtown Greensboro, NC provided a gorgeous venue for the 11th Annual Dancing with the Carolina Stars to support Operation Smile Carolinas. Operation Smile exists globally to provide quality care and safe surgeries for children born with cleft lip or cleft pallette and other facial and dental conditions. Operation Smile is an international charity that works with volunteer medical teams to reach out in remote locations to conduct surgeries in safe and secure environments. 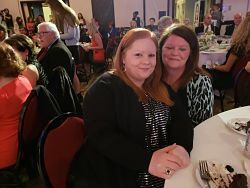 Woodruff Family Law Group was thrilled to be a Bolero Sponsor for this black-tie event and has proudly supported this magnificent cause for many years. 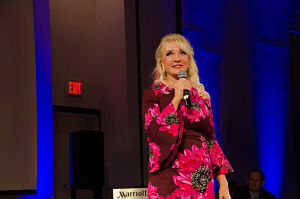 This year, Carolyn Woodruff was delighted to serve as Event Chairperson as well as display her ballroom dancing talents as one of the Showcase Dancers. 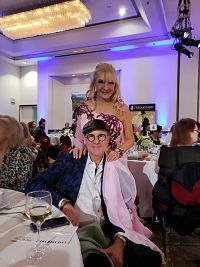 Fantastic cocktails, a 4-course dinner and auction items including enticing jewelry, trips and tickets were just a portion of an exciting evening. Twelve local stars from the Piedmont Triad area were paired up with professional dancers to put in months of sweat (and probably some tears) to learn and perfect their performances in the 11th Annual Dancing with the Carolina Stars competition. As a result of all of the generous hours of hard work, donations and fundraising, almost $300,000 was raised to continue to fund an admirable, worthwhile cause and allow the volunteers for Operation Smile to continue to make hopes and dreams come true for families across the world. 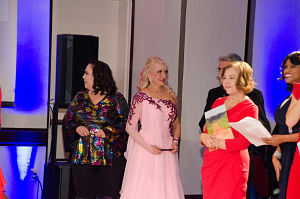 Click below to see Carolyn's performance as a Showcase Dancer.